I missed putting together outfits and showing them off on here. Is that ridiculous? 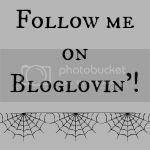 I’m sitting here watching (and LOVING all over again) The Hobbit: The Desolation of Smaug and going through my photos choosing what to post and what I will write about them! It’s silly what you miss about blogging but there’s something so familiar about sitting down and doing this again. I’m very, very grateful that I’m able to do this once again! First thing I’m going to show you is an outfit from a few weeks ago. I’m sorry for the rubbish light- that was taken at my Nan’s house and when I was still trying to get to grips with my new(ish) Samsung Galaxy S4. 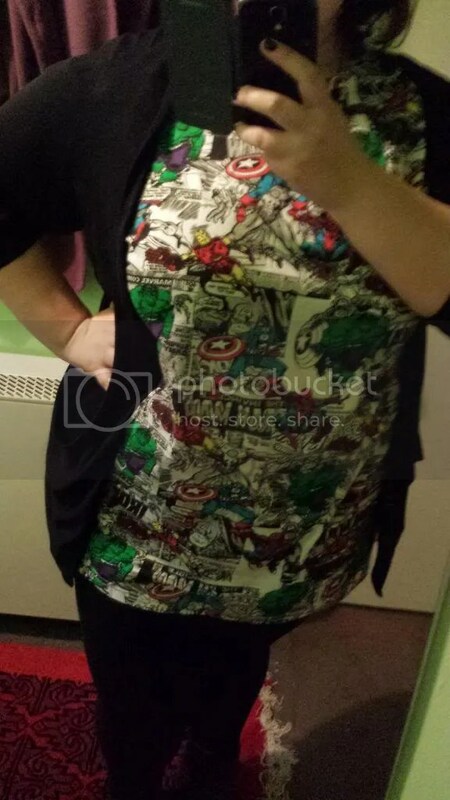 It’s one of my new favourite pieces, being a t-shirt dress/tunic from Primark with an all-over Marvel comics print. I love it so much! I’m so excited about Primark’s new Marvel comics licensing, and the top is so comfy and fits me so well to boot. I’m wearing it with an open New Look cardigan and black New Looks leggings, and believe I wore some fake Docs from ShoeZone as well! 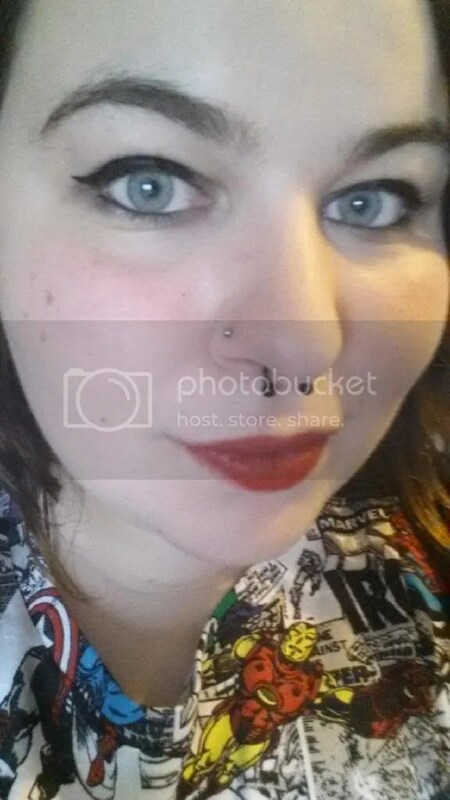 This was my makeup look that day (and pretty much a standard makeup look in total, really). I can’t remember all of the products I used here, but I know that the lipstick is my new(ish) Revlon Matte lipstick in Really Red (love!) and that the eyeliner I’m using on my top lid is my new secret champion and Holy Grail product- P.S. Love felt tip eyeliner from Primark! Yes, I’m not kidding- Primark. It costs £1.50 and is the BEST eyeliner I have ever used. I’ve already bought back ups (as you will see shortly) because it doesn’t smudge, it’s SO so black, it’s easy to use and it lasts all. Day. Long. No joke. So, this past three weeks have been the Easter holidays for my mum and I (we work at the same private school and got nearly four weeks off, not bad!) and we were planning an Oxford Street trip for a while. Yesterday, we went and I had evil intentions to spend in Selfridge’s Beauty Hall and Primark, amongst other places. Apart from picking up one thing in Superdrug, these were the only places I spent, so not so bad! I’ve done so much overtime lately, and did a whole week of babysitting for a family from school which earned me a nice bit of extra money, and whilst I’ve been relying on retail therapy a great deal in the last month or so, I wanted to treat myself to a few bits. Let’s have a look at what I wore, first, because I was really excited about this outfit (how sad is that, haha!). Sorry about the flash! 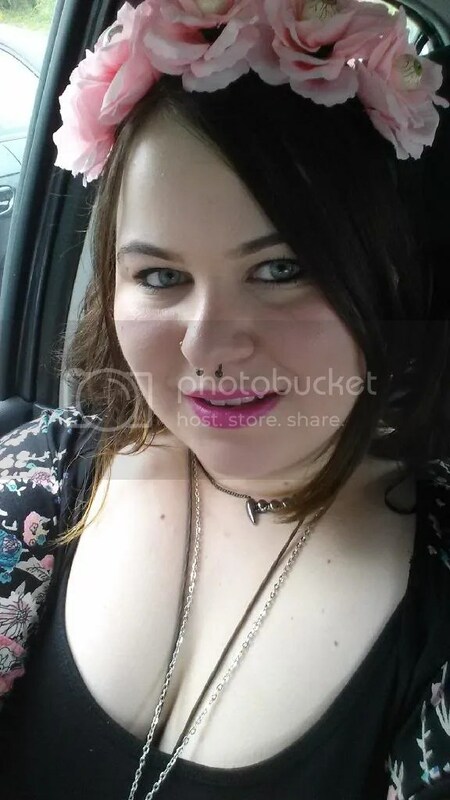 You can’t see in this photo, but I also wore a flower crown with eyeballs in it! Haha, I actually got so many compliments on this bonkers combination, it made me feel really good about it. 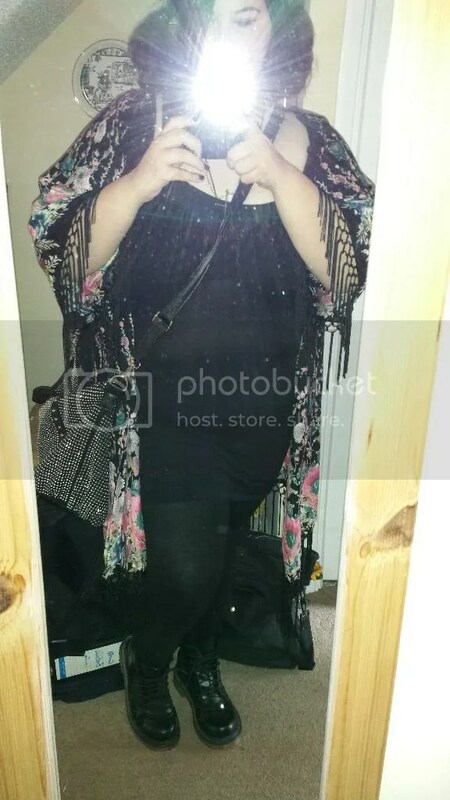 I’m wearing a basic vest-dress from Primark, with a long, fringed kimono (also from Primark, in the beachwear section) on the top, New Look leggings and fake Docs. I love kimonos, they’ve become a bit of a new ‘thing’ for me. They go with most outfits and let me wear things I’d normally be uncomfortable with. The studded bag is also from New Look and was a Christmas present and is a new favourite. I tend to alternate between this bag and my skull-embossed number from Primarni. Can you see the eyeballs in the hair crown? How cool is that! I kept on getting double-takes from people as I walked down the street, and the lovely lady that served me at Illamasqua thought it was amazing. I bought it from the Black Rose in Camden, which stocks pieces from Dollies little Folies, a super cool little accessories brand handmade by the lovely Dollie Daniels. She does all sorts of quirky, macarbe things, like hair flowers with skulls or heads in, and they’re really good quality. Well worth a look if you’re in Camden! As far as my makeup goes, I wore my current default base (Maybelline SuperStay Better Skin foundation and Matte Me Powder), with Soap & Glory Love At First Blush and MUA Undress Your Skin Highlighting Powder. I also used a few more current/new favourites, being the P.S. Love felt tip eyeliner pen, Urban Decay Zero eyeliner pencil, Collection No Clumps mascara and Company Lashes mascara (No Clumps first, Company Lashes second) and Maybelline Brow Drama in Medium Brown. I also wore MAC Candy Yum Yum (because it’s Spring!) and used MAC Club on my eyelid, blended out with MAC Cranberry, though you can’t really see that! First stop (after Superdrug but I haven’t photographed that, that will be in a ‘recent drugstore purchases’ post!) was Primark, where I spent the princely sum of £24. I picked up two t-shirts- a Lion King one and a DC one with Wonder Woman, Batgirl and Supergirl on it- an on-trend pair of nineties style sunnies (though I bought them cos I like them, it was much less about being trendy…) and some cute glittery butterfly lights for my room. I also stocked up on P.S. Love eyeliner! 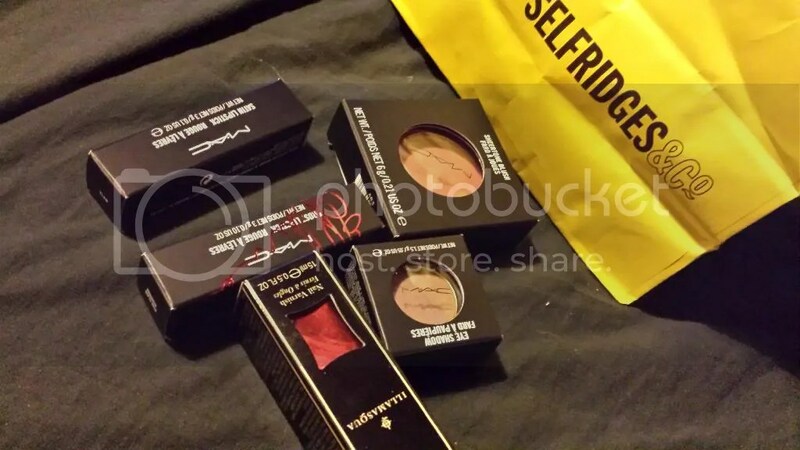 We then popped into Selfridges, where I had a mental shopping list and headed straight for Illamasqua, followed by MAC. Not pictured is a late birthday present for my mum, which was Illamasqua Powder Eye Shadow in Wolf. For myself, I picked up a nail varnish in Scarab from Illamasqua, and then the MAC Viva Glam Rihanna lipstick, MAC Myth (which is a Satin finish) lipstick, a Sheertone blush in Pinch Me and an eyeshadow in Sable (Frost finish). I’ll have a review post up soon, with swatches and a look for you. Mum and I then walked up Argyle Street and made our way over to Chinatown for some dinner. We ate at the London Chinatown restaurant -aptly named- which we’d never tried before but was pretty delicious! I had Kung Po prawns, mum had Chicken in Black Bean and we shared some stir fried veggies, plain noodles with beansprouts and egg fried rice. It was far too much really but we’d had nothing else to eat that day and it was a nice treat. Whilst in Chinatown, I popped into one of the little shops and got the most amazing thing ever! 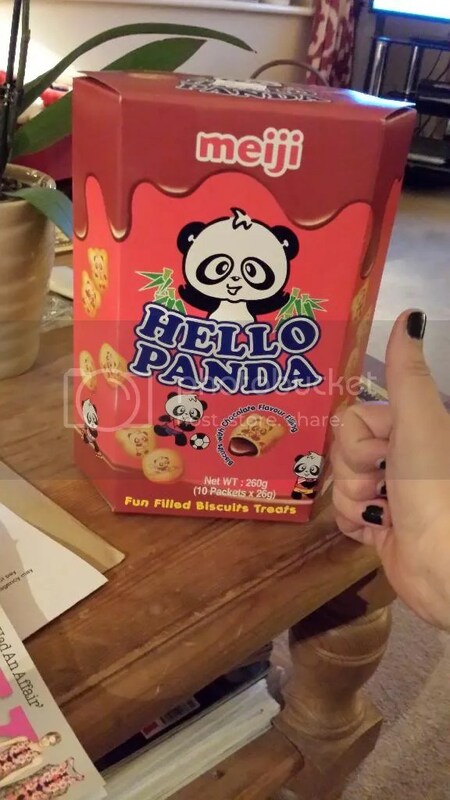 The biggest box of Hello Panda cookies I have ever seen! 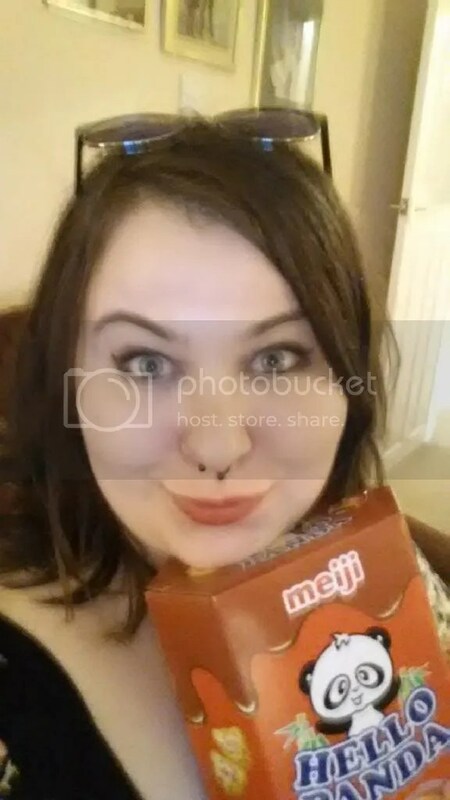 Hello Panda are ridiculously addictive, I first tried them when I was at University and my God they are good. I tried putting my hand next to them to give it a bit of perspective, but I’m not sure how well it worked, so here: have a lovely, blurry photograph of my face to show it better! So big, but so good! 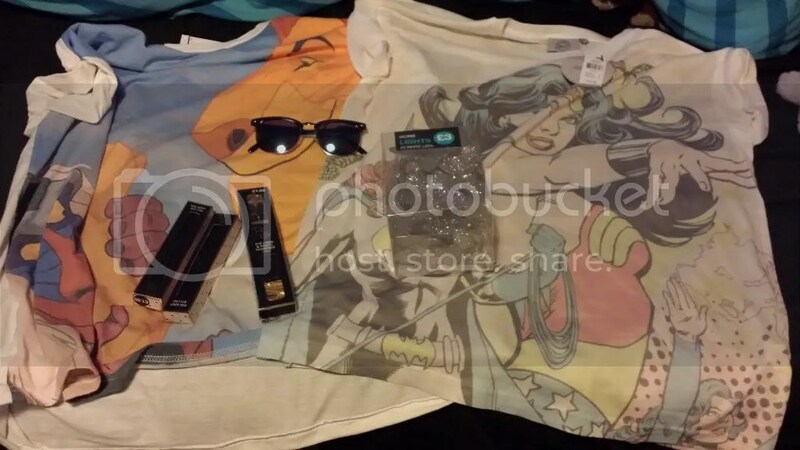 This entry was posted in Beauty, Hair, Makeup, Daily Look, Fashion- Designer, Fashion- High Street and tagged goth, haul, Hippy, Illamasqua, Kimono, Lion King, MAC, Myth, primark, PS Love, Rihanna, Selfridge's, Viva Glam. Bookmark the permalink.